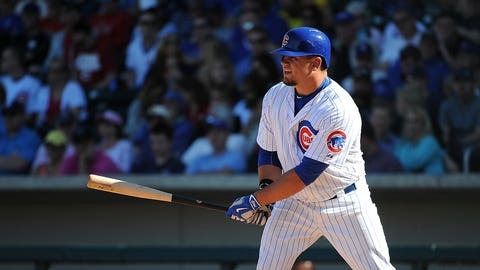 Is Schwarber the Cubs’ missing piece? Maybe, after all, this just isn’t the Chicago Cubs’ season. They’re well behind the Cardinals in the Central, and their negative run differential hardly bodes well for the future; a more sophisticated methodology has the Cubs finishing a couple of games behind the Pirates and missing the playoffs by just one game. Then again, maybe this is the Cubs’ season. One game’s hardly even a trifle. Which means the Cubs can’t really afford to throw away any games. No, I’m not talking about Kris Bryant. Those eight games without him are gone, and anyway the Cubs lost only three of them (one of which was particularly close). I’m talking about left field. Last year, most of the Cubs’ left-field innings went to an approximately replacement-level player. Hey, these things happen. Especially with rebuilding teams. This year, though? Most of those left-field innings are going to that self-same (approximately, and with all due respect) replacement-level player. Is left field the Cubs’ only real weakness? Actually, yeah. At least if you believe Starlin Castro will hit again someday. 1. Fowler 2. Rizzo 3. Russell 4. Bryant 5. Schwarber 6. Soler 7. Montero 8. Castro 9. P Should be Cubs' lineup starting tomorrow basically. You know about Kyle Schwarber? – Schwarber was the fourth pick in last year’s draft. – Schwarber has been destroying baseballs for every moment of his short pro career. – Schwarber was a catcher in college, but nobody who’s seen him seems to think he can actually catch. Oh, except for the Chicago Cubs. And probably Schwarber. Toward the end of spring training, I became intrigued with Schwarber. First, there’s that name: Schwarber. Can you imagine Mickey Mantle being Mickey Schwarber? Joe DiMaggio as Joe Schwarber? Ted Schwarber? Great baseball players aren’t named Scwharber. Until one is. So the Cubs drafted him. Fourth. Which was seen in many quarters as an “overdraft”; whether they really believed he was the fourth-best player in the draft or they were looking to save a little money to spend on later picks, who knows. Maybe a little of both. Anyway, after signing, Schwarber caught some, played left field some. And hit. Hit a lot. While essentially relearning how to catch (apparently he didn’t pick up many of the finer points while toiling for the Hoosiers). After the season, he spent a lot of time with minor-league field coordinator Tim Cossins; during spring training, he spent a lot of time with major-league catching coach Mike Borzello. I’m not any sort of scout. I saw Schwarber catch a couple of innings in the middle of March. There were four or five pitches in the dirt, one of which did get past him. There was a successful tag play, and Schwarber looked athletic enough. This season in Double-A, he’s hitting again. A lot. He’s also playing some left field and doing some catching. Which isn’t going so well. Kyle has done an amazing job framing pitches. He is one of the best I’ve seen this season in the league. The other very good trait for him is pitch calling. He has split time with Willson Contreras behind the plate, getting 3 of every 5 games. Receiving still needs development, along with his footwork and positioning when throwing out runners. However, he brings confidence to the pitcher and works well with the umps. Then again, in 30 games behind the plate, Schwarber has six passed balls and has given up 43 steals. Not that the steals are all his fault, but in 20 games, Contreras has only two passed balls and 15 steals allowed. And suddenly I’m reminded of Mike Piazza, who actually did some of the little things well but struggled with the obvious ones. But hit a lot, in fact hit so much that he’ll soon be in the Hall of Fame. Is that Schwarber’s path? I sorta doubt it. When Piazza was obviously ready to hit in the majors, the Dodgers made him their catcher. I don’t see the Cubs doing that, considering Miguel Montero’s signed through 2017 and still seems at the top of his game. Will the Cubs leave Schwarber in the minors long enough to significantly improve his throwing and stop letting pitches get past him? I sorta doubt it. He’s hitting too much. Right now, Schwarber’s at the same age and same level as Kris Bryant just one year ago. Schwarber’s not hitting quite as much as Bryant did. But he’s not far off, and one imagines he might hit even better if he didn’t have to spend so much energy learning to catch. Getting back to the original issue, though! Would the Cubs be better right now if Schwarber just skipped Triple-A and took over in left field for the big club? Well, that’s hard to say, isn’t it? Schwarber’s probably a better hitter than Chris Coghlan right now, but he’s surely a worse fielder. This is just something we assume about a sometime catcher who’s listed as 6 feet – I didn’t have the presence of mind to compare my height to his when I could have – and 235 pounds. My guess is the Cubs will eventually tolerate his defense in left field, then either move him to first base when Anthony Rizzo gets expensive or trade him to the Red Sox. Now, though? Arismendy Alcantara and Javier Baez, both of whom were exiled to Iowa earlier this spring, have thrived in the Hawkeye State. Relative to their Land of Lincoln performances, anyway. Between Alcantara and Baez and whomever else is hanging around, somebody should be able to cobble together an above-average batting line and make most of the plays in left field. Schwarber’s something, for sure. I just don’t think he’s the Cubs’ missing piece this summer. Dept. of Corrections: As a reader points out, Schwarber hasn’t actually played any left field at all this season. In 45 games, he’s DH’d in 11 and caught in 30. Which obviously makes it even less likely that the big club would just toss him into their lineup as an everyday left fielder. For the moment, it’s probably catcher or designated hitter or bust. And they still make the pitchers hit in the Cubs’ league. Department of Clarifications: As Bleed Cubbie Blue’s Al Yellon points out, Anthony Rizzo’s signed to a team-friendly long-term contract and won’t be "expensive" for a long, long while. Which doesn’t necessarily mean Schwarber can’t take over at first base, but that seems possible only if Rizzo suffers some sort of terrible injury or (more likely) Rizzo’s traded. Bottom line, it’s just hard to find a place for Schwarber to play on this team, as currently composed.